You are currently browsing the archives for the tag 'Manufacture Hermès movement'. 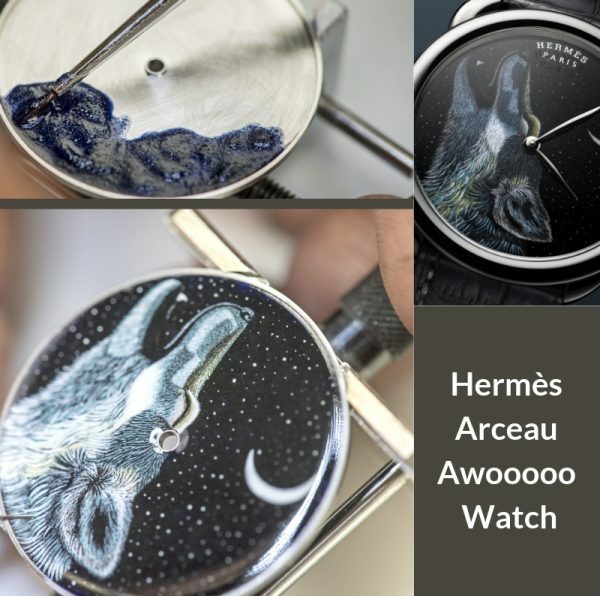 When you cry ‘wolf ’, it appears on the dial of the new Arceau Awooooo ! watch. 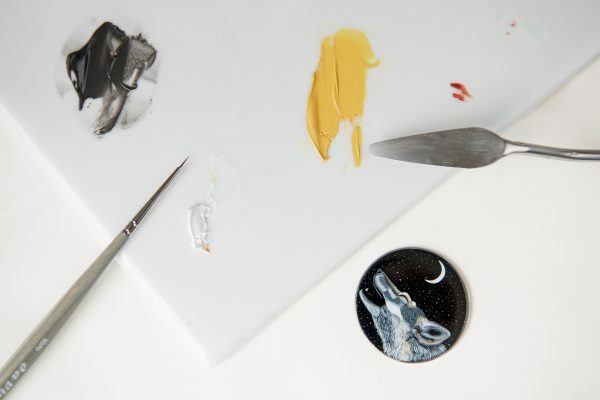 Crafted in enamel, the silver-furred animal stands out against a starstudded backdrop featuring a slim moon crescent. 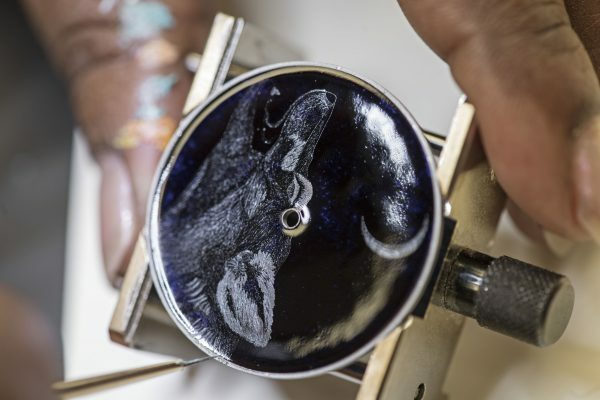 This miniature scene is beautifully framed by a white gold case and a matte graphite alligator strap. A new character in the bestiary designed by Alice Shirley, the Arceau watch now calls “Awooooo!” with its motif initially created for a line of men’s scarves. 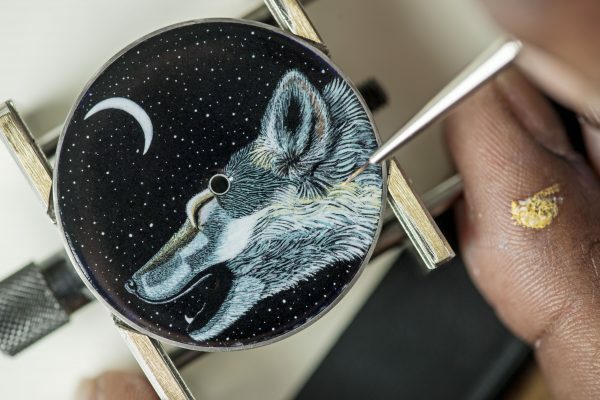 The fascinating yet feared white wolf of myths and fairy stories emerges from the woods, gloriously wild and depicted in miniature on an enamel-painted dial. 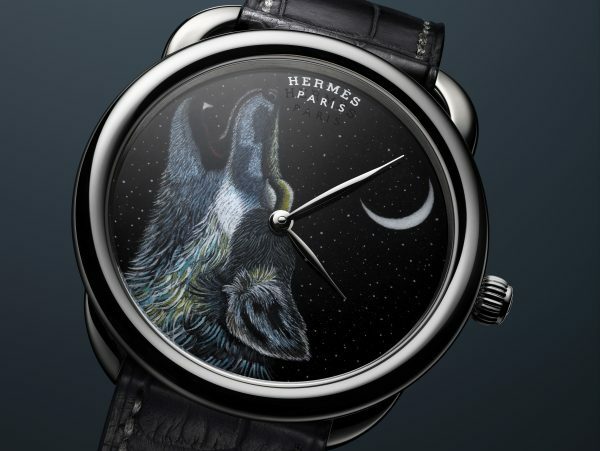 In reproducing the refined original design, the wolf and its star-studded background spring to life by dint of meticulous workmanship. 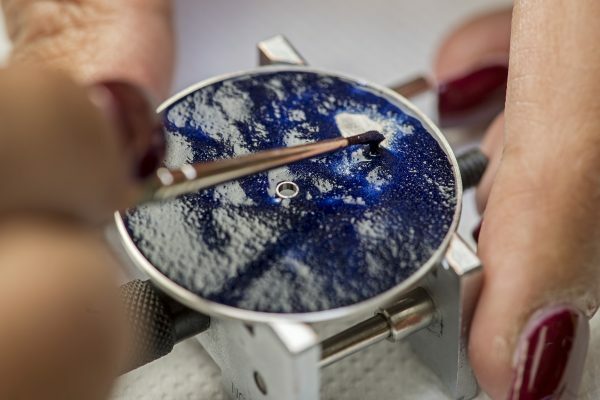 The artisan crafts both sides of the transparent white enamel dial, then carefully polishes it to achieve a perfectly smooth surface. The outlines of the motif are then traced and, using an extremely fine brush, various enamel powders are applied mixed with natural oils. Then come several successive stages of coatings, interspersed with drying and firing in the oven, before the painting takes shape in all its magnificent realism. Using a graphic style and subtle shades of grey, the animal is shown in its natural, essentially nocturnal way of life. A starry night and a slim moon crescent also evoke the cycle of nature, within which the predator plays an essential role. The overall tone matches the white gold case, whose round shape topped by stirrup-shaped lugs houses a Manufacture Hermès movement. Fitted with a matte graphite alligator strap, its classic design imagined 40 years ago by Henri d’Origny accentuates the elegance of this eight-piece limited edition. White gold base enamelled using the miniature painting technique.